Choose a clinic whose reputation matches your expectations! Before starting laser tattoo removal, check the clinics reviews and before and after photos to assess what results you can expect. Tattoo removal is a complicated procedure that relies on the best technology and the most experienced operator in order to remove any tattoo safely and effectively. 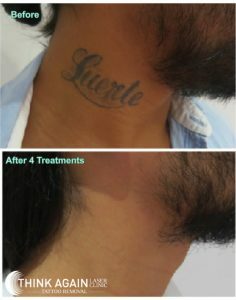 Laser tattoo removal is a process achieved over time. 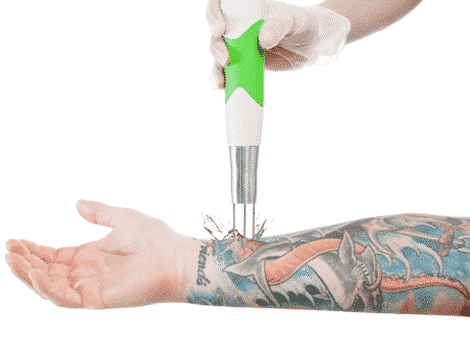 While the laser breaks up the ink of your tattoo, it is your body that is conducting the removal process. For this process to be the most effective, a six-week break in between treatments is necessary. The whole tattoo cannot be broken up in one go, for this reason time is your best friend. Most clients will require between 5 – 10 treatments at Think Again Laser Clinic. Some factors we just can’t predict such as the amount of ink in your skin, the more ink that has been used the more treatments you will need. Contrary to popular belief, the older the ink, the better for laser tattoo removal! Why? As we age, so to does our tattoo. Regardless of how you care for your ink, your body is constantly trying to remove the pigment from your body from day one. When it comes to tattoo removal, the older the ink, the more efficient the process. Any tattoos aged 5 years plus should show results much faster than those brand-new inks. With so many different lasers currently being used for tattoo removal, how do you tell them apart? Lasers require two very important factors to be effective for tattoo removal, power efficiency and true (not dye) wavelengths. 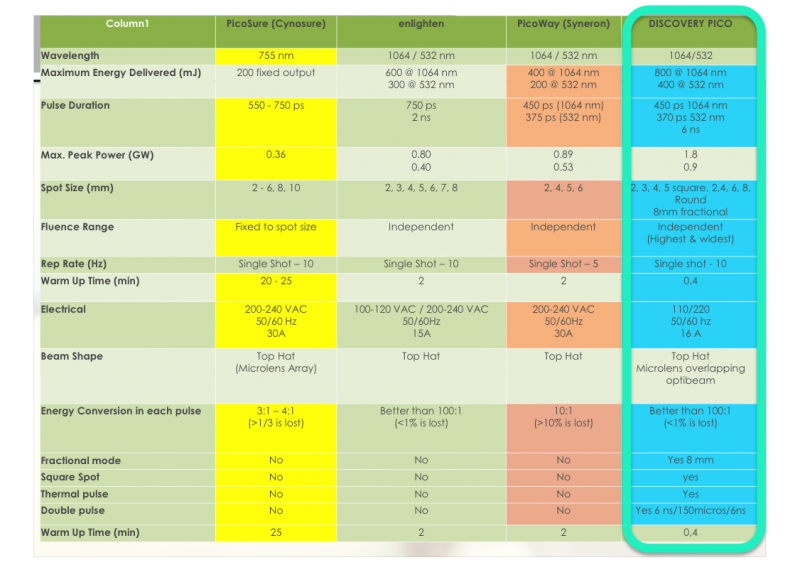 It is also important to know the difference between ‘nano’ second and ‘pico’ second technology. Picosecond technology will ensure more tattoo ink is broken up from each treatment however currently the Discovery Pico Plus is the only picosecond laser on the market with the power capacity to do so effectively. If you are unsure on how to read or understand the statistics of each laser, make sure you check through the clinic’s before and after photos to see if their claims match their results. The number of treatments you will need will depend on a number of factors. Certainly, the clinic you choose plays an important part, the laser system and experience of the operator are one side of the process. However, factors that contribute to your tattoo removal will ultimately determine how many treatments you need. The age of your ink, location on the body, colour of ink, amount of ink and how healthy and hydrated you are all play a part in the process. 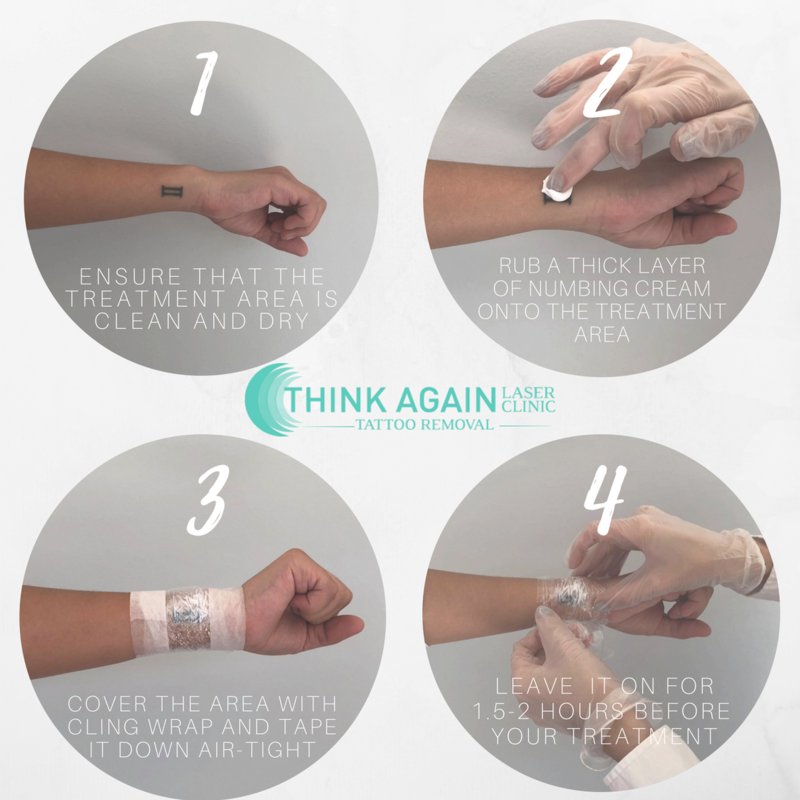 We have seen many clinics offer 5 or 6 treatment guarantees and there is a very simple reason why this just won’t work – every single tattoo is different and so to will be the outcome. 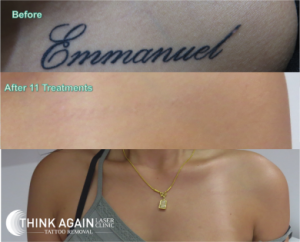 The majority of clients at Think Again will have their tattoo removed between 5 – 10 treatments. However always remember, we have the same goal you do and that is to remove your tattoo in as little treatments as possible. Your skin however will never be compromised, and we will never try to achieve the unachievable by trying to speed up the process. Also, Best quality Tattoo machines should be used for making tattoos for safety reasons. The ink of your tattoo will be removed through your body and excreted naturally. Your lymphatic system (waste disposal) will collect the pieces of ink and carry them out of your body. The ink cannot be removed out of your skin as they were put in with the needle. It is important to know that once you have the tattoo, laser is the only safe and effective method of tattoo removal. 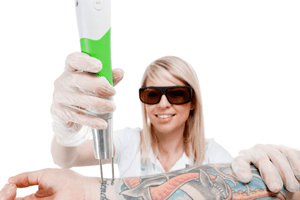 Directly after laser tattoo removal the feeling of your skin is comparable to a good sunburn. Your skin will feel warm and tender to touch. After you take your bandage off 24 hours after treatment you may notice your skin looks quite red, bruised or swollen. While blistering is uncommon, they can occur. At Think Again Laser Clinic our Quanta Discovery Pico Plus utilises a fractional laser which we use to minimise downtime after laser tattoo removal and reduce the chance of blistering altogether. Proper aftercare is also an essential part of the process to ensure you receive the best results. Unfortunately, laser tattoo removal is still highly under regulated in New South Wales. What that means is that there are clinics operating lasers unfit for the procedure. There are also clinics with inexperienced staff performing the procedure and causing irreparable damage to the skin. Don’t be another statistic. There is no current standard of technology, experience or education required to operate a laser to remove a tattoo. We constantly see people enter our clinic who have been through multiple treatments at another clinic and have still seen no results or with visually damaged skin. 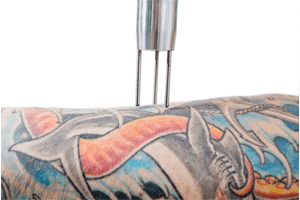 Unfortunately, it is not easy for our clinic to pick up the pieces; it can become far more difficult to remove a tattoo that has already been treated unsuccessfully. **Special Note: Make sure you check the before and after photos before committing to any clinic. Make sure they have many examples to show you and be sure to ask what specialist achieved the results and if all of the photos are examples the clinic has achieved themselves. Some clinics still show manufacturer photos which are not a true indication that they know how to achieve the results for you. Why is time so important? Your body is what is removing the ink from your skin, the laser is simply allowing your body the means to do so. While our laser manufacturer has recommended 4 weeks to be a suitable time frame in between treatments, at Think Again we have chosen to stick with a 6-week break. 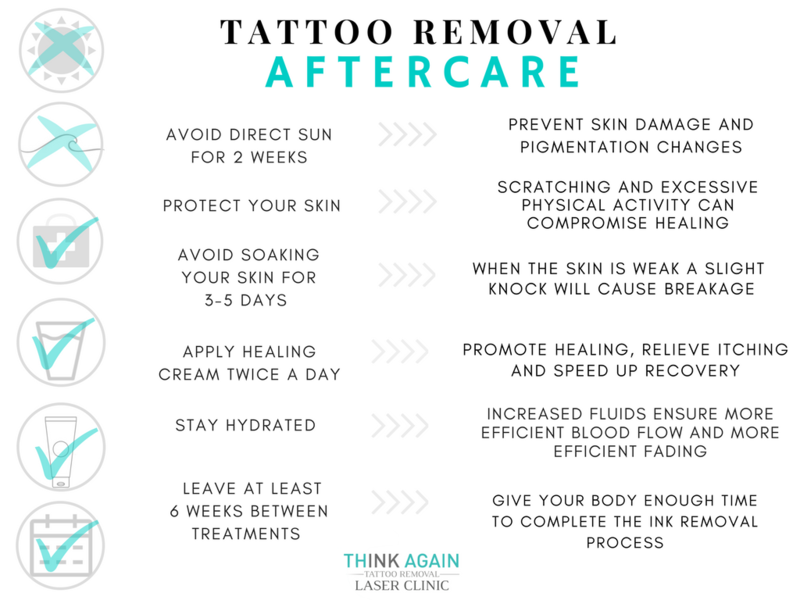 We want your tattoo to be removed in as little treatments as possible, to do this and to ensure the most out of your money waiting 6 weeks is an important part of the removal process. Tattoo ink needs to be filled in tattoo machines for making permanent or semi permanent sketches. If you are after industry leading results, we are Sydney’s #1 rated tattoo removal clinic. With over 100 5-star reviews across Google and Facebook we can ensure if you are after the best results our specialists are the ones who you can trust to do so.